A good vocal booth is crucial to any mix, but we home studio engineers don’t always have access to the kind of super quiet, controlled, soundproof rooms that you find in the high priced studios. We at Blue House Records would like to give you an example of how easy it can be to create a make shift vocal booth, with a little backstory for context. The setup for recording vocals worked well on previous songs. We simply set a condenser microphone in the middle of an isolated room, threw on a pop blocker and went to work. 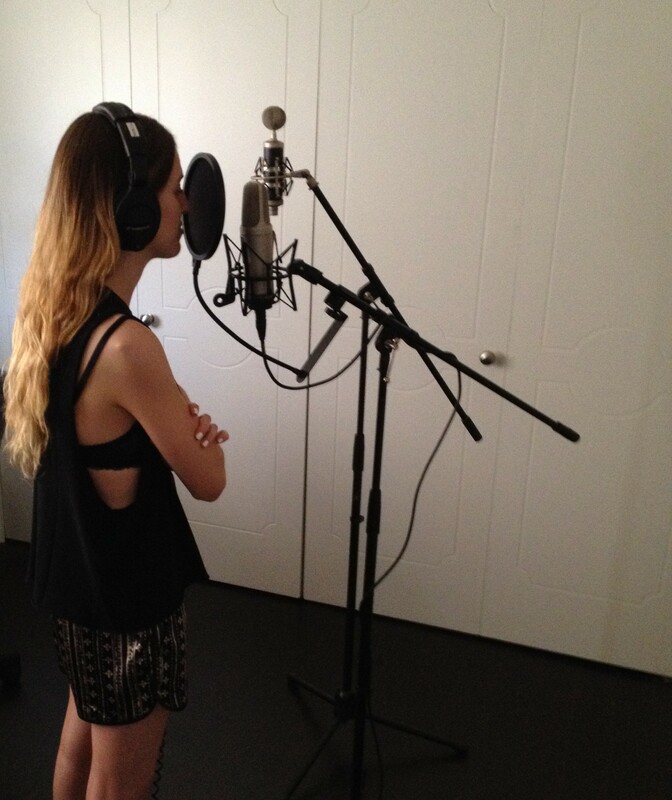 However, this track was a rocker, and Alexa would be singing much louder than in previous recordings. As Alexa let her voice open up, the louder sound bounced around the large room creating unwanted noise. 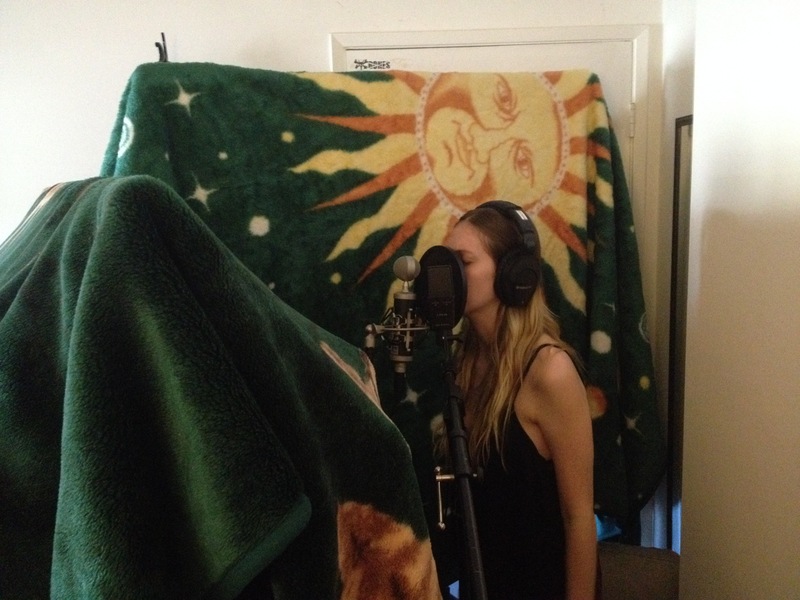 To correct the issue, I asked Alexa to bring some heavy blankets to our next vocal session. We then found a smaller room, propped up a few microphone stands, clothing racks—whatever we could find, draped the blankets over the stands, and placed some larger couch pillows around the room for dampening. It took us 5 minutes to set this up, and the result was a much tighter, cleaner vocal that easily sits in the mix on a very guitar and drum heavy track. The following are excerpts from the alt rock track we’re working on. This first sample was recorded in the larger room with no dampening. This second sample was recorded in a small room with soundproofing and improved microphone positioning. And here’s a snippet of the final product. This entry was posted in and Master, Audio Production — Record, Mix and tagged Audio Recording, better vocals, bluehouserec, bluehouserecords, improved vocals, microphone, recording vocals, tracking vocals, vocal session, vocals on November 9, 2014 by ttatman10. Since signing up for the Beats Music app last month, I’ve experienced a boost in music knowledge, a renewed passion for music discovery, and an ability to connect with artists, producers, audio engineers, industry tastemakers, and friends in a way never realized with other music streaming services. First thing’s first,–let’s get this out of the way. Some of you may know that I’m employed by the company I’m writing about today. But hear me out. I work for Beats Music because they provide a service I believe in. And I write this blog to share my beliefs with you. Besides, you and I both know Blue House Records doesn’t pull the kind of web traffic to get paid for this kind of thing (womp womp). I listen to a lot of music, and I love it. It’s no surprise — my job revolves around music, and so do most of my hobbies. But I recently found myself at a crossroads. I had hit a music discovery dead end prior to subscribing to Beats Music. I was a subscriber to several music streaming services at the time, with thousands of songs that I had painstakingly arranged in an obsessive fashion — playlists compiled from years of research, experience, and exposure to the music industry. But even after all this work, I was still missing out on a crucial part of listening to music: discovering new stuff. As a musician, audio engineer, and music industry dude, I needed to stay up on the new and a desire to rediscover the classic tracks of the past. I needed a change. Enter Beats Music. With scary accurate recommendations on the “Just For You” page, Beats Music suggested artists and albums I’d never considered listening to, and curated playlists full of new and old school jams that felt like I had handpicked it. These curated playlists, built by real life music experts housed at the Beats Music HQ, are a great way to dive into new genres, eras, and music styles. “Intro To” playlists provide an overview of an artist’s best work, giving you a quick and easy way to listen to an artist’s most popular work. “Deep Cuts” provides a look at the obscure tracks, great for the die hard fans who get sick of hearing singles repeated every day on the radio. “Retreating from the hazy Danger Mouse-fueled pot dream of Attack & Release, the Black Keys headed down to the legendary Muscle Shoals, recording their third album on their own and dubbing it Brothers. This is brilliant for two reasons: a) I’m discovering great new music everyday that I would have never come across otherwise, and b) I’m being exposed to the stories, and details behind the music — real music literature that connects fans and artists alike on an awesome level. For the curious listeners, the die hard fans, those looking for more depth, these playlists contain the gems not heard on your local radio station, a collection of tracks that show another side of the artists you love. My first exposure to this feature was the Beastie Boys: Deep Cuts playlist, mixing old school goods with the more recent jams that flow seamlessly from beginning to end. What influence did punk music have on The Strokes? Where did M83 pull that massive 80s pop/synth sound from? What folk music should I listen to if I want to figure out where Jack White gets his riffs and songwriting style? “Influences” playlists provide these answers and more, giving the listener a comprehensive look into what made our favorite artists who they are. Forget Singles, We Want Albums! An album is a musical story, with a beginning, a climax, and an end. Twists and turns that spark your emotions, provoke your thoughts, connect with you in a unique way. The digital revolution brought more focus to the single, removing much of the heart and soul that generations of years past enjoyed through vinyl, cassette tape, and CD. Many of us have fallen into this trap, accepting what is given to us from top 40 radio stations, nightclubs, TV, restaurants, and everything in between. We’ve been missing out on the depth and emotion inherent in the full-length album. Beats Music has designed a platform that offers the functionality and selectivity of other services, the ability to select from “Top Songs” and singles as you wish, but also encourages the listener to enjoy music from a broader spectrum. The “About” section tends to focus more on the core concept and style of an album. The artist’s cover artwork is visible throughout as you scroll through artist pages. Most full-length albums have a unique and thought-provoking story behind them. And maybe most notable, the “Essentials” feature provides a look into the records that changed the game for certain artists; what Nevermind did for Nirvana, what Reasonable Doubt did for JAY Z, and what Under The Table And Dreaming did for Dave Matthews Band. Beats Music is more than a streaming service — it’s a music company from top to bottom, founded by legendary producer and entrepreneur Jimmy Iovine and hip-hop icon Dr Dre, headed by CEO Ian Rogers (Beastie Boys, Topspin Media). Throw in a creative team led by award winning musician and composer Trent Reznor (Nine Inch Nails, The Social Network) and you’ve got a house full of music heads. These folks know their stuff, and realize the importance of putting the fans and the artists first. For example, Beats Music is the only streaming service out there that pays independent artists the same as the majors — one of the many ways Beats Music adds confidence and a sense of pride to the music streaming business. This cohesive goal is part of what motivated me to move out of the agency, promoter and management world and join Beats Music. Have you had a similar experience with music streaming services? Have you tried Beats Music? Hit me up with any questions or comments; I would love to hear your feedback. This entry was posted in Product Review and tagged Beats, Beats App, Beats by Dre, Beats Music, blue house records, music discovery, music industry, music streaming service, Streaming Music on March 31, 2014 by ttatman10. We’ve all heard the phrase: You have to spend money to make money. It’s a popular expression because it’s true. This hasn’t changed over the years, but the method of getting yourself out there to actually make the cash and get your band heard certainly has. The days of driving all over town to staple up flyers are for the most part extinct, and the days of clicking a button to obtain the same result has arrived. The world of digital downloads and streaming video; of websites and computerized graphic design; of Facebook event invites is ready and waiting for you. To start, I want to address a statement I’ve heard from quite a few of the more inexperienced artists I work with: “I don’t care about the money, it’s all about the music.” …I’m totally with you. I’m on the same page. Unfortunately for both of us, if you absolutely don’t care about making money, no one is going to hear your music. This is true for a variety of reasons, but one is very overlooked by newbies; and quite possibly the most important: No one is going to take you seriously if you offer play for free. When a booking agent hears this, they immediately think: This person doesn’t play anywhere else. No one is coming to this show. or He must not be very good. That may be an exaggeration, but you get the point. Even if you really don’t care about money, don’t play for free. Unless of course it’s a charity fundraiser or something to that effect, then by all means get the publicity and help out a good cause. One thing to remember is you can spend the money you make playing gigs on whatever you want. In other words if you really don’t care about the money or don’t need it, invest it right back into your music career. You can buy merch, business cards, a Bandzoogle website, flyers, studio time or more equipment. (We’ll get to that in a minute.) If you can do it financially, this is the best option. The more of these things have, the more professional you appear and the bigger the shows you can book. To put it into perspective: More people will hear your music. I funded a world tour almost exclusively from playing shows. There is no end to the possibilities of your music career if you simply put in effort and make it happen. This is huge. When you talk to a booking agent, club promoter or any interested party for that matter, they almost exclusively ask the same first question: Do you have a website where I can check out your music? If you want people to take you seriously; and get more people to notice your band, your answer should be yes. The biggest issue with this in most cases, is that most musicians don’t know how to build a website and they can’t pay a programmer the generally high amount of money to make one for them. I have your solution, and it’s cheap and easy: Bandzoogle. I was tipped off to its existence a couple of years ago by a fellow musician, and it changed my music career almost immediately. I felt like a rockstar when I could tell people to “check out my website.” I booked more shows and had a place to send people when they asked about my music. It’s only $9.95 per month for their cheapest plan which includes a basic design and your very own “.com” address; $14.95 a month for the aforementioned items plus full design customization and some extra storage for music files and photos as well as fan statistics; and finally $19.95 if you want all of that along with download codes which you can hand out as promos at shows, etc. The design part is incredibly easy. You simply pick a theme, and drop whatever you want into it. Videos, pictures, news, a show schedule, contact form or even html code. Uploading your music is very simple as well: all you have to do is upload them and add a title and Bandzoogle provides a very nice little music player at the bottom of the screen. You have the ability to allow or disallow free downloads of your music. I can’t stress the importance of this enough: Get a website. No excuses. Plug that URL everywhere once you do. These are cheap… incredibly cheap; and you will be surprised at how many people say things like “Oh wow, you even have cards? !” Again, you look more established and credible. I use Vistaprint for my business cards. You can choose from literally hundreds of pre-made designs into which you can simply type your information; or you can upload your own design using their downloadable template. If you know how to do basic graphic design, I recommend the latter option. Make sure to include your name or band name, contact phone number and email, website and what kind of music you play. If you want a custom design and don’t know how to design one, contact me on my music website: www.tomedwardsmusic.com under Booking, and put “Business Card Design” as the subject. My email is at the bottom of the booking page. See how I did that? Now you’ve heard my music. I’ll reiterate: Plug that URL everywhere. I charge very low rates for fellow musicians: Usually $30 for a card design, depending on how detailed you would like it. Make Social Media Accounts: This should be a no-brainer for modern music marketing. Make a Facebook fan page, a Twitter account and a YouTube Page. Studies on Facebook user interaction have shown that 1-4 engaging and interesting posts have better results than posting overly frequent. Think quality over quantity. Twitter is a different animal, and you should be tweeting at least once a day if not more. Try to post things that you think people will share or retweet. I tend to take a humorous approach to my posting in order to gather more attention. This is especially effective on Twitter. And again: Post your website URL on there and share it. This is a great way to make your music available to people and appear more credible. I haven’t mentioned having good-quality recordings in this article for the sake of sticking to new-age-related music marketing tips, but you should know that it’s important. By all means, get creative with it, too. Try to think of original or unique photo ideas and pay somebody who knows what they’re doing to take them. In this day and age, with everyone calling themselves a photographer, it’s pretty easy to find someone for cheap to do this. Make sure to check out their work and see if it fits the style you’re aiming for. This is very important for credibility on your website and social media pages; as well as flyers. I use Reverbnation for this. It’s kind of like a pseudo social media site for musicians, in which you can share your music, bio, shows and booking information. The reason I still use it even after creating a website is for it’s integration in other social networks, like Facebook; or even your website. You can put a music player on your Facebook fan page, which is pretty crucial, and I use their embeddable show schedule widget on my website when I’m home in the states. I know I said the day and age of flyers is over… well, I lied. Somewhat, anyways. I still use flyers at many shows, albeit I don’t plaster them all over town unless it’s a big event. I usually just post a few in a venue a couple weeks before I’m schedule to play there. The other big use for flyers and graphic design ability is on your website and social media pages. It always looks better to have a nice looking graphic at the top of a Facebook event page or website. Music marketing is all about your credibility; i.e., your appearance as an established musician. I can’t say that enough. Making flyers is pretty simple, but make sure you have a decent program to do it with. I use Adobe Photoshop, but there are plenty of other options available for cheaper. For the love of all things holy, don’t use Microsoft Paint. You’d be better off with a picture of a piece of cardboard that you’ve drawn on with a Sharpie. If that’s your only option, skip the self-design tasks for now. This is something I highly recommend learning basic or intermediate skills in, though. It gives you the ability to look extra-professional without the price tag. For big things like album artwork however, pay someone who knows what they’re doing. I can always spot a do-it-yourself album cover. A lot of times I cringe, which is sad for bands who have a great sound to put out there. To summarize, get with the times or forever live in the dusty shadows of open-mic night acts. If you’re all about the music and you don’t care about money, perfect. I love your attitude and I share the same one, however we now both know the part it plays in our success as musicians. Put in some work, spend a little money and get yourself heard. No one is going to notice your band unless you help them find it. We’re all ready and waiting to listen. This entry was posted in Blue House Records Featured Artists, Get LOUD! Music Marketing & Promotion and tagged artists abroad, blue house records, Music Business Marketing, music promotion, tom edwards, tom edwards music on September 10, 2013 by ttatman10. We had the pleasure of checking out Mikal Cronin and his band at the 2013 FYF Fest this weekend. After getting funky to their enormous live set, we can’t stop listening to the latest record from Mikal Cronin, titled MCII, which has a great live vibe to it. Songs like “Change” and “Weight” put us back on the festival grounds, center stage amid a sea of concertgoers, as the guitars bellow out massive, driving rock chords, the drums shake the ground beneath you, and the catchy 80s and 90s indie style pop melodies turn you into a backing vocalist for the day. Check out music from MKII below, and check out this NPR edition of World Cafe, where Cronin sits down to chat with host David Dye and play a few songs with his band live in the studio. Concert dates to be posted here http://mikalcronin.bandcamp.com/ with an upcoming concert at The Fillmore in San Francisco, September 2, 2013. This entry was posted in For Your Listening Pleasure and tagged blue house records, FYF Fest 2013, MCII, Mikal Cronin on August 25, 2013 by ttatman10. Blue House Records studios, we knew we had found a focused young woman with a clear musical vision. 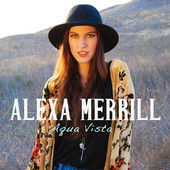 Aqua Vista, her latest EP released this Summer, was pre-recorded and produced by Merrill as a demo using GarageBand software. Merrill had composed 5 musically elaborate tracks, complete with string arrangements, intricate percussion patterns, powerful overdubbed guitars and vocal melodies that seemed to move flawlessly across a wide harmonic range. These exploratory compositions ranged in style from American Rock to elements of Indie and Folk Rock, Pop, Soul, and R&B, and carried heavy lyrical power with words surrounding many of the developmental and life changing experiences associated with today’s youth and young adults; transition, loss, relationships, and difficult life choices. Aqua Vista was recorded, mixed and produced at Blue House Records studios in Los Angeles, CA. This entry was posted in Blue House Records Featured Artists, Music News, New Music Release! and tagged Alexa Merrill, alexa merrill music, Aqua Vista, blue house records, Exclusive New Release on July 29, 2013 by ttatman10. Get LOUD! How Do I Promote My Music? The #1 question we hear from artists today is “How can I promote my music to reach more fans?”. Maybe you’re a performing musician looking to get more fans to your gig, or you’ve got some great music up on your webpage but are having trouble directing traffic and gaining unique visitors. This post is for YOU! The truth is there is no one universal trick to increasing your audience. You have to think like a marketer who is selling a product, and determine exactly who your buyer will be and what their particular needs are. Yes, it can be deflating to think about words like “sell” and “product” when you just want to be creative, lay down epic tracks and party, but if you’re looking to grow your audience yourself, something that is essentially a requirement at this juncture in the music business, you will have to learn to think from the point of view of the music fan and develop a plan to speak directly to your unique audience. Below are some tips on just how to get started learning and speaking to your audience. Know your audience, all the way down to their age, gender, location, where they shop, what websites they visit, what they do for fun, and of course, what they listen to. Check out some more established artists that are similar in sound and lyrical style to your own. Research their fans, take note of fan comments on Twitter, Facebook and other social media outlets, focus on what drives them to stay locked in to this particular artist, and what the artist does to keep them coming back for more. 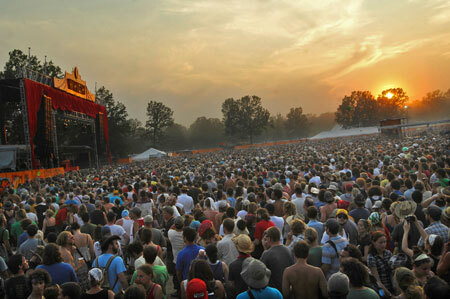 Find out where your audience hangs out, shops, discovers music and culture, and where they attend concerts. Work your tail off to get your music in these places, whether you’re booking 30 minutes as a supporting act, working with a local business to get your music on their website, or working out a consignment deal to get your music in their stores. Putting in the work necessary to learn who your audience is, and then focusing efforts on these areas will greatly enhance your chances of developing your fan base. Recruit some friends to post concert promo flyers (or share a social media post) with their names on them around town, directing fans to bring flyers to the show for free entry, a CD, t-shirt, or poster. Reward the friend with the most flyers (or most retweets/likes) turned in with an awesome prize, maybe a hug or high five? Perfect! Partner with a local business to exchange promotional efforts. Mention their name in your flyer or at your show in exchange for music play or product placement in their store. Organize a fundraiser to support your favorite charity, invite other local musicians to perform and combine marketing efforts to reach a wider audience, increasing participation in the fundraiser and ultimately growing your fan base. Get to work on some ideas of your own! What do you have to lose? You’re an independent artist with no commitment to anyone, start acting like it and take some chances! A typical misconception made by musicians, and brands for that matter, is you can’t be successful unless you are liked by anyone and everyone. This is untrue, many professionals make a great living marketing to those who love them for who they are and what they do. Focus on what makes you great, speak directly to your audience, and realize the benefits of fan loyalty. Erika Napoletano, rockstar author, has a great book on this concept called The Power of Unpopular. Check it out! Most importantly, make music everyday, and keep it funky. Unless your music style isn’t funk, then you would keep it bluesy, or jazzy, or rocky, or hippity hoppity? This entry was posted in Get LOUD! Music Marketing & Promotion and tagged blue house records, do it yourself music marketing, fan loyalty, get loud, get loud!, grow audience, increase fans, keep it funky, music business, music industry, music marketing, music promotion on July 6, 2013 by ttatman10. Listen to it. It’s ahead of it’s time. It’s funk-tastic. The funky clav sounds, the ghost notes on the snare, for the drummers out there, are just right. That is all, enjoy your Saturday night, and if you’re partying, party hard. This entry was posted in For Your Listening Pleasure and tagged blue house records, funky, Levon Helm, The Band, Up On Cripple Creek on June 22, 2013 by ttatman10.